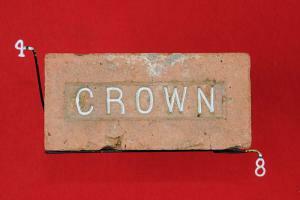 Here is an excerpt from the Dallas Historical Society website with a photo of the Crown brick plant as it was used in the tv show Route 66 http://dallashistory.org/phorum/read.php?2,68873,68950 Sylvan Garonzik, a Dallas jeweler, owned and operated Crown Brick Manufacturing Company at the old Ferris plant in Mesquite from 1954 to 1968 so that would have been its name during the 1961 Route 66 filming, though many still referred to it as the Ferris Brick Company. In 1958 Garonzik established a plant to manufacture a brick facing/chipping device in front of the kilns on Hickory Tree Road. The brick kilms and ca 1946 arena were on land that sloped downward to South Mesquite Creek on the east. Gay built the 1958 arena on higher gound to the northwest of the kilns. 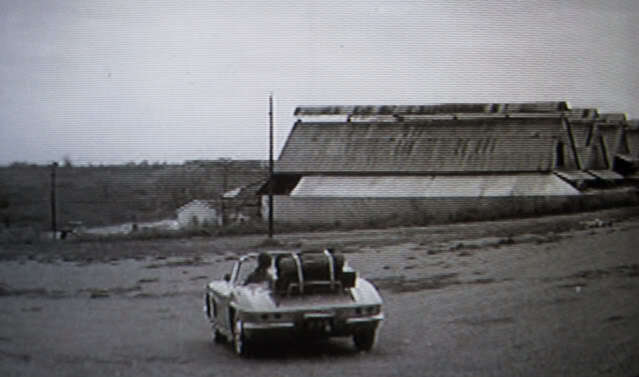 The first screen capture with the Corvette would appear to have been taken near the arena facing southeast with Hickory Tree Road beyond the small frame house or office. In 1968 Garonzik leased the brick plant to Reliance Brick Company for a period of 5 years. In 1969 the entire property was sold, minus the brickmaking machinery, to a California invetstor. Neal Gay was the Real Estate broker. The kilns still appear on the 1973 photo revision of the 1959 USGS Map which was not field checked in 1973. Only the kiln foundation footprints are visible on the 1972 aerial so the kilns would have been dismantled by then. I do not know the disposition of the brick making machinery or the brick facing device and cannot ascertain when that separate manufacturing plant was dismantled or demolished but may have survived the kilns by a decade or more.